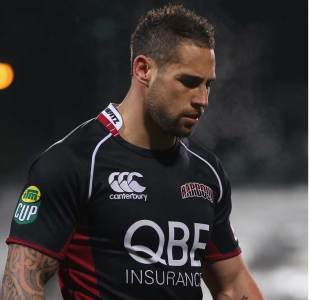 Former All Blacks centre Luke McAlister has successfully negotiated an early release from his contract with the New Zealand Rugby Union in order to link up with Top 14 side Toulouse immediately. The 27-year-old will be released from both his New Zealand and North Harbour playing contracts following the ITM Cup match against Counties Manukau on Wednesday. McAlister's release follows his failure to make the All Blacks squad for the World Cup which starts next month in New Zealand. The announcement brings an end to the saga which began back in early July. McAlister failed to turn up for North Harbour training and was subsequently dropped from their squad. However, after making amends, the 30-cap Kiwi has since lined up for the ITM Cup side. However, McAlister will play his final game on Wednesday and North Harbour Rugby chief executive Brett Hollister said: "We've worked with the New Zealand Rugby Union to negotiate an appropriate release with Luke, including an early release fee. "We're obviously very disappointed that he is leaving during our 2011 ITM Cup campaign - as our season was planned on the expectation Luke would play for us. "The reality is he wishes to start his new contract in Toulouse this month and for us that means finishing the ITM Cup season without him." NZRU general manager professional rugby Neil Sorensen said: "While this is a disappointing end to Luke's career in New Zealand, we have agreed that this is the best outcome for everyone involved and we wish him well."